The Bureau of Labor Statistics (BLS) released their monthly Consumer Price Index (CPI-U) and Inflation report for the year ending in June on July 17th. This resulted in 0.12% Annual Inflation. The BLS rounded this to .1% which of course is so small that almost any one of the deflationary months last year would cancel out all the inflation we’ve seen over the previous 12 months. The CPI-U index a year ago was 238.343 and is currently an almost identical 238.638. 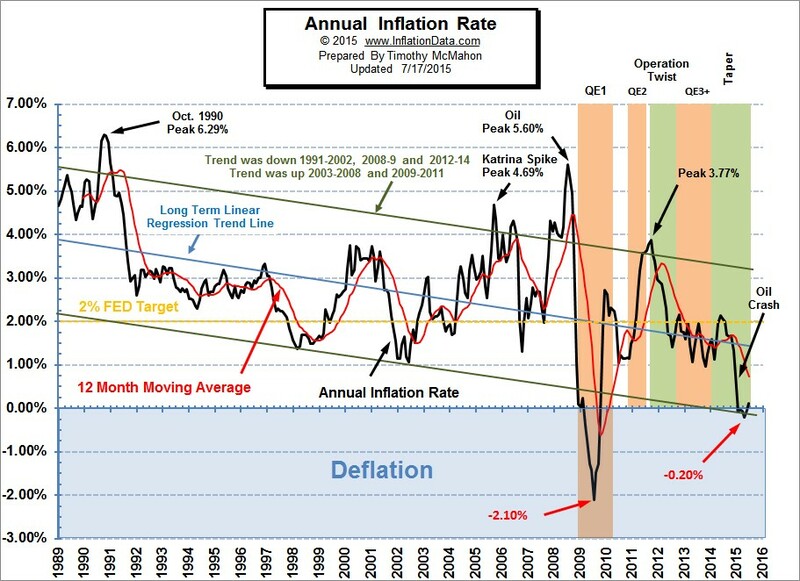 January through May 2015 saw deflation on an annual basis although each month was inflationary in and of itself. But due to the massive deflation of the fourth quarter of 2014, all the monthly inflation was cancelled out. However, June’s monthly inflation finally tipped the scales back toward inflation. In 2014 the entire 4th quarter was deflationary with October at -0.25% in one month, then November racked up a whopping -0.54%, and December tacked on another -0.57%. And to top it all off the normally highly inflationary January (2015) came in deflationary instead at -0.47%. So those four months alone resulted in -1.83% deflation. Adding to the deflationary forces for 2014, July and August also saw monthly deflation as prices fell -0.04% and -0.17% respectively. From February 2015 on, we had monthly inflation but it took until June 2015 to wipe out all the previous deflation . Our Annual Inflation Chart shows how small the current blip is with it barely visible above the zero line. We can also see how small the deflation was according to the BLS for this year. However if we look instead at the independent data from the Billion Price Project a calculation from M.I.T. economists Cavallo and Rigobon, we see a much sharper decrease with deflation at -1% rather than -0.1%. Unfortunately, they delay the public release of their data for 60 days so the most recent data available is from April 20th. 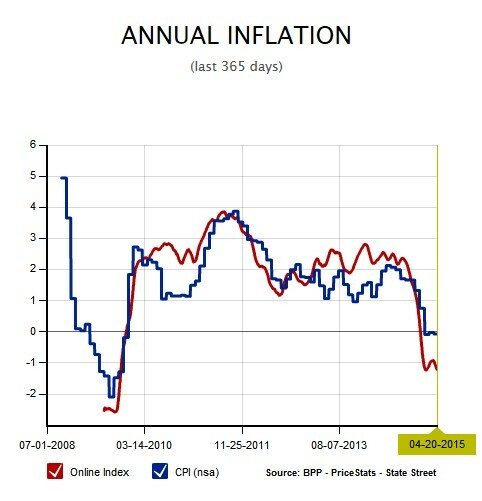 For more information see Can We Trust Government Inflation Numbers? If inflation is the dog that didn’t bark in recent years despite massive central bank stimulus, a mere whine might prove enough to rattle investors. That’s the warning of some economists who are starting to question whether financial markets are underestimating the threat of a pickup in prices among developed nations. Our Moore Inflation projection (MIP) continues to perform well and is projecting a an increase in inflation into year end. However, the new year should see some moderation in the inflation rate. For more information see Inflation Forecast. The misery index as of July 2015 (based on the most recent official government data for June 2015) is at 5.42% (5.3% unemployment and 0.12% inflation) down from a peak of 12.87% in both October and November 2011.